This is the view of opposition Senator Anesia Baptiste. Baptiste was speaking about what she views as the infringement of rights and freedoms in this country at the New Democratic Party(NDP) open forum which took place at the partyâs headquarters, Democrat House, on Tuesday, March 22, 2011. Baptiste, who stated that the passing of several âwicked billsâ in parliament is a hindrance to justice, added that the current ULP administration is threatening the rights and freedoms of Vincentians through the institution of such bills. Baptiste was referring to the Criminial Procedure Amendment Act which became law on March 1, 2011, and the Representation of the People Act (RPA) Amendment Bill (2011) which had its first reading on March 3, 2011, and is now at the Select Committee stage. âLook carefully at the effect of those bills. 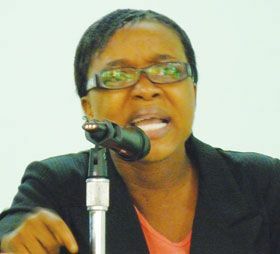 They hinder justice,â Baptiste said, as persons now have to receive permission from the DPP (Director of Public Prosecutions) to bring private criminal cases against persons. She added that the government has also used and abused its authority in parliament to remove sections of laws. âI am saying to people of St. Vincent and the Grenadines that the protection of rights and freedom is at stake,â Baptiste stressed. She added that this should not be the nature of political parties, or government, adding that government is about the protection of rights and freedoms of all the people, which is what the NDP is concerned about. Baptiste, quoting from the United States Declaration of Independence, stated that the Americans knew what justice and freedom were all about and that they fought for their rights and freedom. Baptiste read âThat whenever any form of Government becomes destructive of these ends, it is the right of the people to alter or to abolish it,â adding that it was the right of the people of this country to abolish a government that does not protect their rights. Baptiste also referred to nations such as Libya and Egypt which have protested against their current governments, saying that these countries have called for the removal of a government that was a threat to their rights and freedoms. She added that Vincentians have the power and the right to say no to a government which is threatening their freedom. Referring to the ULP administration as a dictatorship, Baptiste said that many persons were deceived by the ULP administration as they were led to believe that they were for the people. Baptiste encouraged listeners to carefully monitor what is happening in their constituencies and to continue to work hard so that the NDP can maintain the seats they have now, and acquire more, come next election.